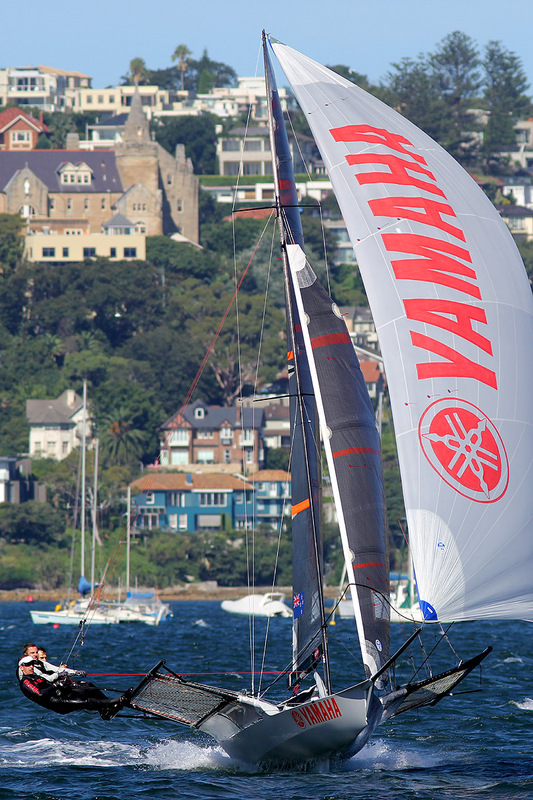 Gotta Love It 7 scored her third consecutive win in the series when she dominated the 24-boat fleet in Race 3 of the 2015 JJ Giltinan 18ft Skiff Championship on Sydney Harbour today. 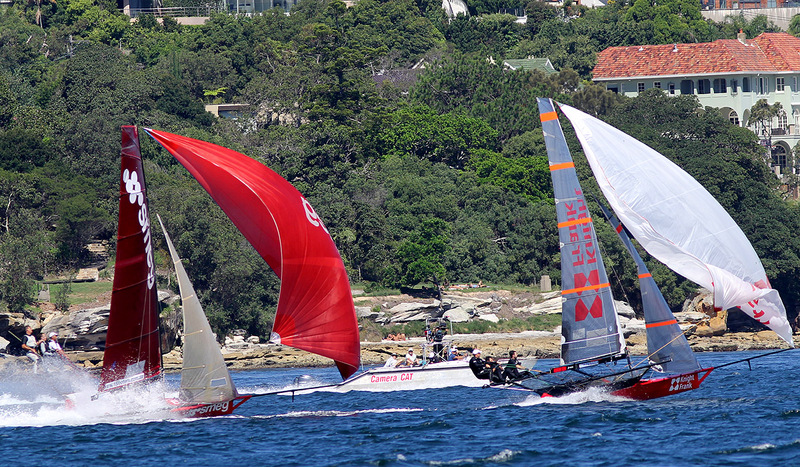 Once again, the defending champion team of Seve Jarvin, Sam Newton and Scott Babbage were not well placed at the start, but it wasn’t long before they had the flying red machine in the lead on the first windward leg. Despite a great performance by the Smeg team of David Witt, Tom Clout and Matt Wark, there was little chance of anything but a Gotta Love It 7. The winning margin was one minute and 34 seconds. The first two teams had established their lead very early and most interest amongst the spectator fleet centred on a wonderful battle for the next five or six placings. At the finish Appliancesonline.com.au (Micah Lane, Paul Montague, Tom Anderson) had worked her way through from a slow start to grab third place, 43 seconds behind Smeg. 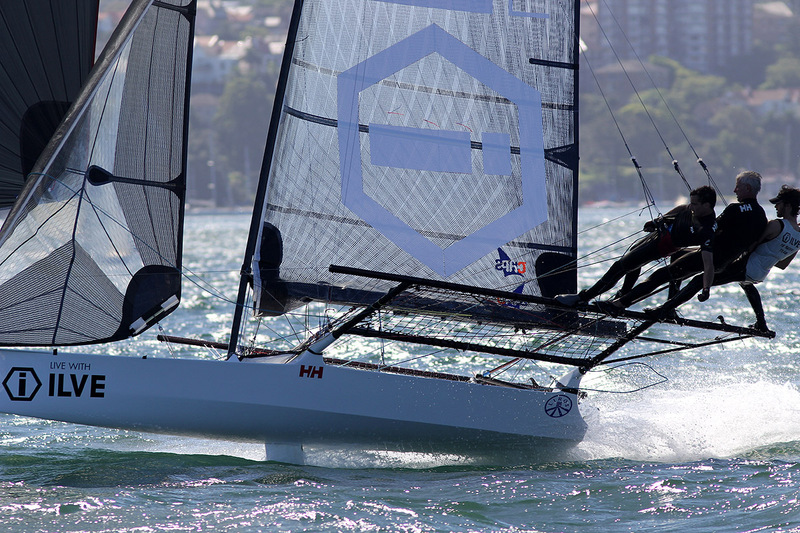 Mojo Wine (Lee Knapton) showed improved form from earlier races to come home in fourth place, ahead of New Zealand’s Yamaha (David McDiarmid) and Thurlow Fisher Lawyers (Michael Coxon). Gotta Love It 7 clearly leads the regatta on three points but today’s placings have tightened up the group battling for second place. 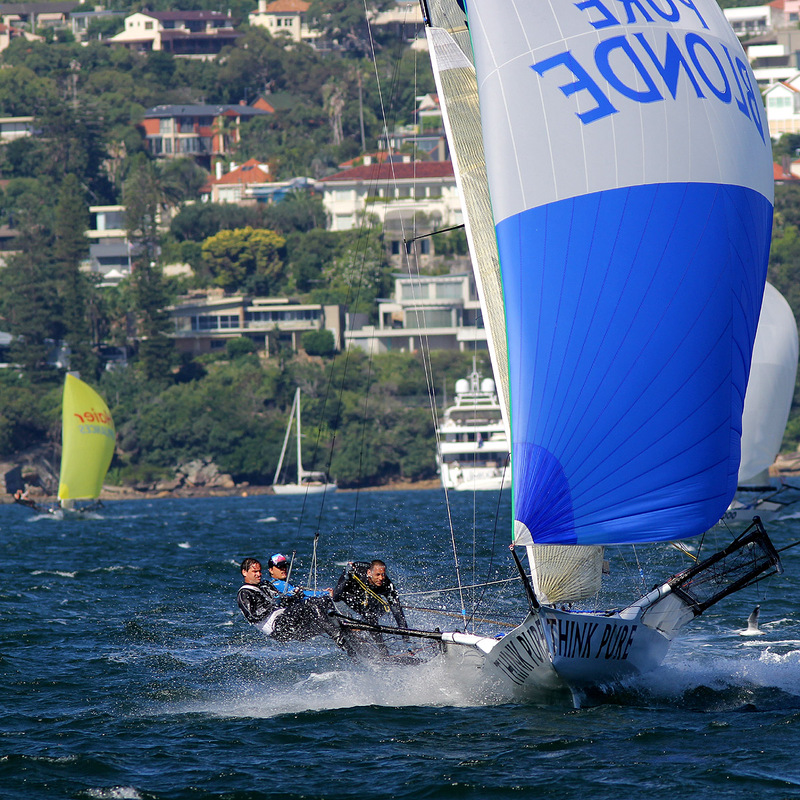 Thurlow Fisher Lawyers has 17 points, Harken (Howie Hamlin, USA) and Mojo Wine on 21, Asko Appliances (Marcus Ashley-Jones) on 23, then Appliancesonline and Smeg on 24. 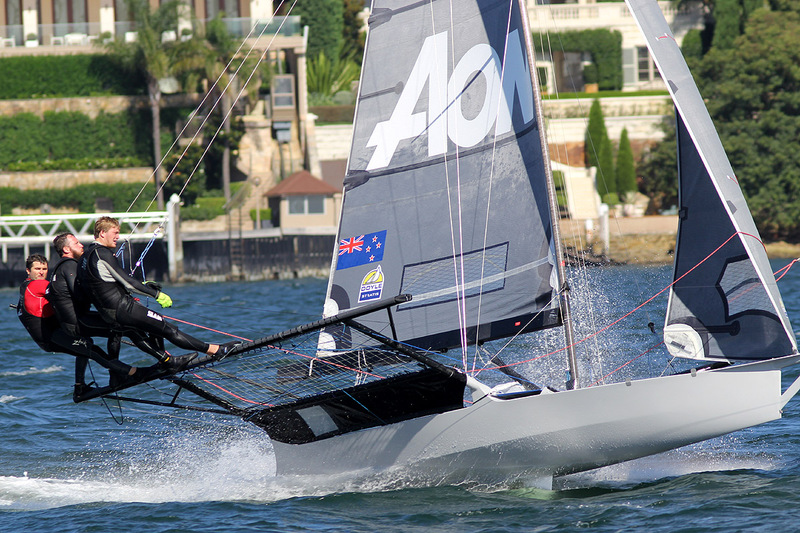 Conditions were perfect for today’s race with all teams using their smaller #2 rigs in the north east wind. 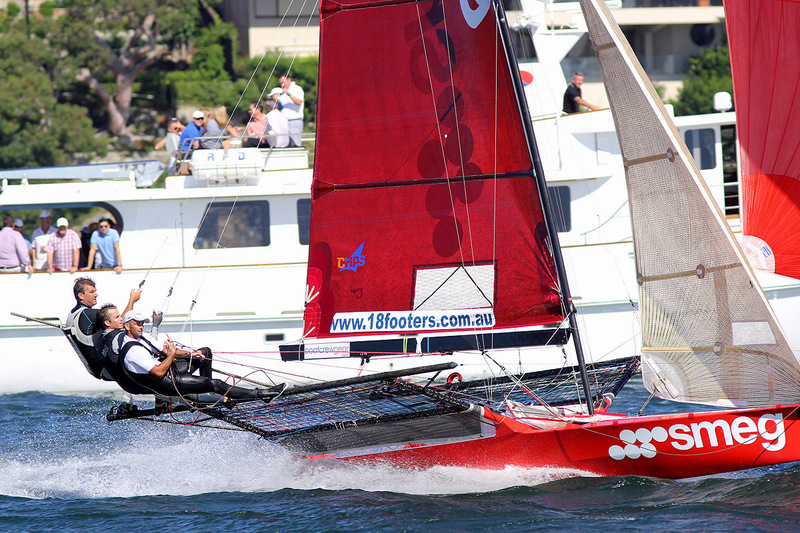 Smeg took the lead from the start with Knight Frank (Riley Dean), Gotta Love It 7, Mojo Wine, The Kitchen Maker (John Sweeny) and Coopers 62-Rag & Famish Hotel (Jack Macartney) in the leading group. 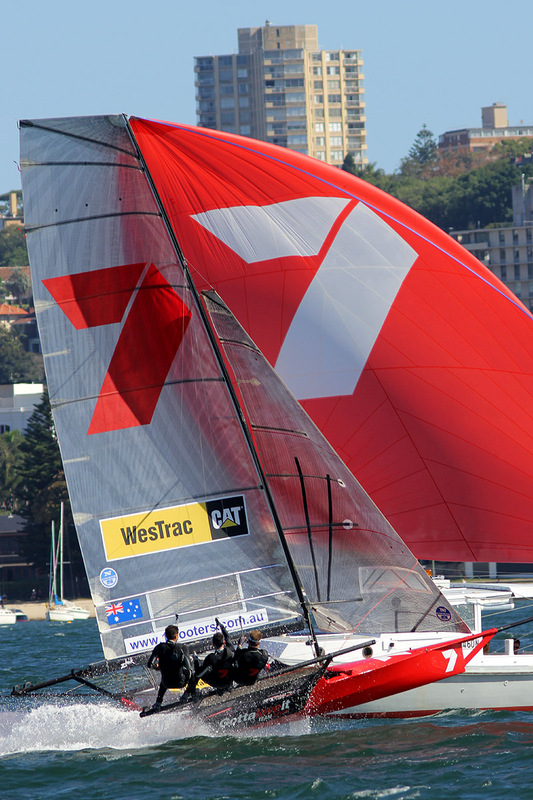 Not surprisingly, Gotta Love It 7 had worked her way to the lead and held a margin of 20s over Knight Frank, Smeg, Appliancesonline, Coopers 62-Rag & Famish Hotel and Thurlow Fisher Lawyers. 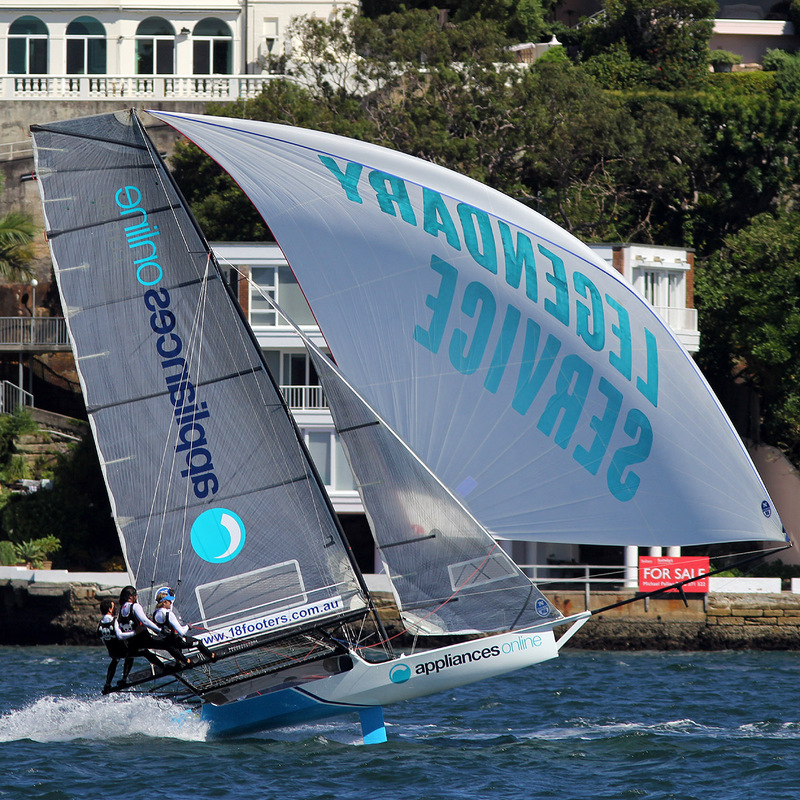 Knight Frank was engaged in a great battle with Smeg as the pair raced along Shark Island to the wing mark in Rose Bay but capsized in her attempt to carry the spinnaker in the testing conditions. By the end of the first lap, Team Seven held a 25s lead from Smeg with Mojo Wine moving up to third ahead of Coopers 62-Rag & Famish Hotel and Appliancesonline. The brilliant crew work by the 7 team saw Gotta Love It 7’s lead extend to 45s at the following windward mark. The big improver was Appliancesonline which was continually making inroads into the fleet.